← In praise of street food! Looks pretty darned good. 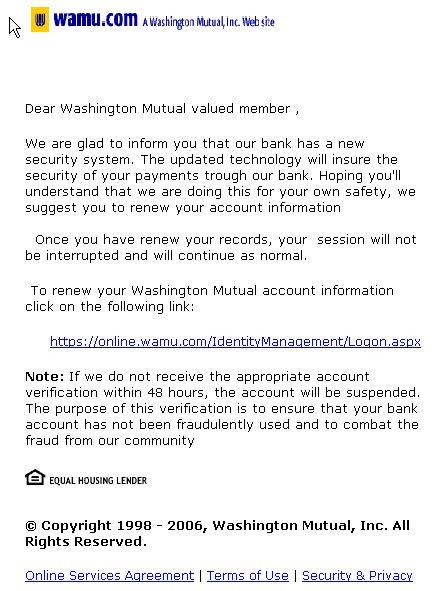 The message is consistent with a phish, especially the “If we do not receive the appropriate account verification within 48 hours” part, where they threaten to suspend the account. Sense of urgency, and all that. You’ll note that while the link looks legitimate (https even), the mouse over shows you’d be sent to an IP site that redirected to another (now-defunct) IP site. Which is typical; these sites will pull content from legitimate links to support their illusion. Don’t be fooled by these.